Point Pleasant’s Adam Veroski prepares to launch a shot attempt during a Sept. 6 contest against Lincoln County at OVB Field in Point Pleasant, W.Va.
Point Pleasant’s Alberto Castillo (10) dribbles his way through a trio of Lincoln County defenders during a Sept. 6 contest at OVB Field in Point Pleasant, W.Va.
POINT PLEASANT, W.Va. — A memorable year. A memorable postseason. 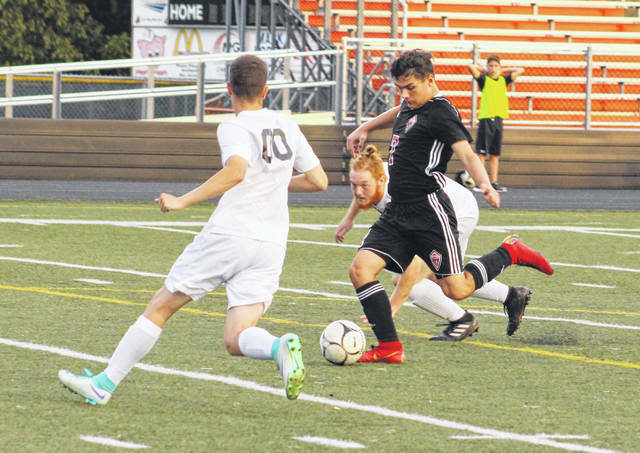 The Point Pleasant boys soccer program netted three selections on the 2018 West Virginia Sports Writers Association all-state soccer teams in Class AA-A, as voted on by a panel of media members throughout the Mountaineer State. The Black Knights ended the fall with a 17-3 overall mark and earned the top seed in the Class AA-A Region 4, Section 1 tournament. For those efforts, the Red and Black came away with a pair of second team selections and a honorable mention choice. Sophomores Alberto Castillo and Adam Veroski were both second team honorees as utility choices, while junior Peyton Hughes was chosen to the honorable mention list. Castillo — a forward — became the first player in PPHS history with 20 goals and 20 assists in the same season, netting 23 goals and handing out 20 assists overall. Veroski — also a forward — buried 21 goals in net and also dished out a pair of assists. Hughes —a center defender — had a single goal and two assists on the year. This year was the first time since 1989 that the Black Knights had two 20-goal scorers in the same season. All three selection are first-time honorees on the WVSWA all-state squad. Khori Miles of Robert C. Byrd was the first team captain, while Tucker Newell of Charleston Catholic was named the second team captain. Castillo and Hughes were also both named first team on the All-Region IV team chosen by the WVHSSCA. Veroski, sophomore Braxton Watkins-Lovejoy and junior Garrett Hatten were also named second team recipients by the coaches in Region IV. Forwards: Zander Schmitt, Nitro; Jacob Estep, Wheeling Central; Khori Miles, Robert C. Byrd (captain); Boston Caruthers, Williamstown. 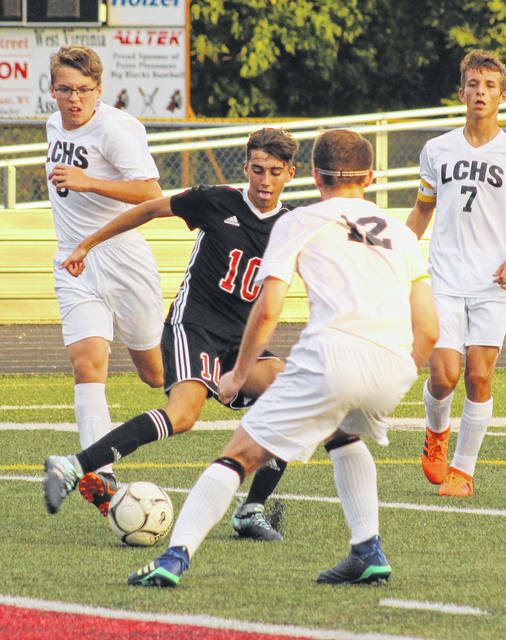 Midfielders: Evan McCray, Winfield; Aiden Slusser, East Fairmont; Jack Cimino, Charleston Catholic: Tristan Nolte, Bridgeport,. Defenders: Evan Garrett, East Fairmont; Justin Mayfield, Nitro; Michael Hoffman, Charleston Catholic,; Philip Englund, Winfield. Keeper: Ethan Malinoski, Charleston Catholic. Utility: Lance Cerullo, East Fairmont; Eli Williams, Robert C. Byrd; Andrew Mahairas, Nitro. Forwards: Corey Fluharty, East Fairmont; Briar Cessna, Frankfort; Gabe Turak, Trinity; Michael Watkins, Herbert Hoover. Midfielders: Michael Floyd, Fairmont Senior; Coen Preston, Winfield; Jonas Branch, Fairmont Senior; Thomas Minor, Wheeling Central. Defenders: Tucker Newell, Charleston Catholic (captain); Tanner Dodd, Robert C, Byrd; Wilson Meeks, Charleston Catholic; Matt Wright, Oak Glen. Keeper: Jacob Clark, Oak Glen. Utility: Alberto Castillo, Point Pleasant; Ryan Shrewsbury, Winfield; Adam Veroski, Point Pleasant. Kolton Alderman, Pocahontas County; Ethan Anderson, Petersburg; Anthony Atchison, Lewis County; Gage Bailey, Oak Glen; Jack Barnett, Trinity; Bryson Beaver, Herbert Hoover; Eric Bevil, Shady Spring; Gavin Bosgraf, Williamstown; Marcus Breckenbridge, James Monroe; John Campbell, Herbert Hoover; Braden Crews, Bluefield; Briar Cessna, Frankfort; Gage Damewood, PikeView; Dan Dwoskin, Oak Glen; Brennan Elliott, Petersburg; Dylan Galford, James Monroe; Devyn Gillespie, Frankfort; Fletcher Hartsock, Trinity; Jaxson Haynes, Sissonville; Chase Howell, Liberty; Peyton Hughes, Point Pleasant; Andrew Komorowski, Wheeling Central; Zach Lamb, Chapmanville; Nathan Lanham, Winfield; Noah Luikart, Poca; Alex Magruder, Wheeling Central; Ian Mitchell, Bluefield; Grant Older, Scott; Zeb Pinson, Huntington St. Joe; Zack Placer, Tyler Consolidated; Marc Sauno, Independence; Hunter Shafer, Pocahontas County; Wil Swan, Charleston Catholic; Kobey Taylor-Williams, PikeView; Jackson Vanscoy, Winfield; Jacob Warrick, Weir.